Some people are turning to life on wheels to avoid San Diego's rising rents and lack of affordable housing. Johnny Perez moved to San Diego from New Hampshire nearly a year ago. Rather than shell out money on rent, Perez is saving it for travel. 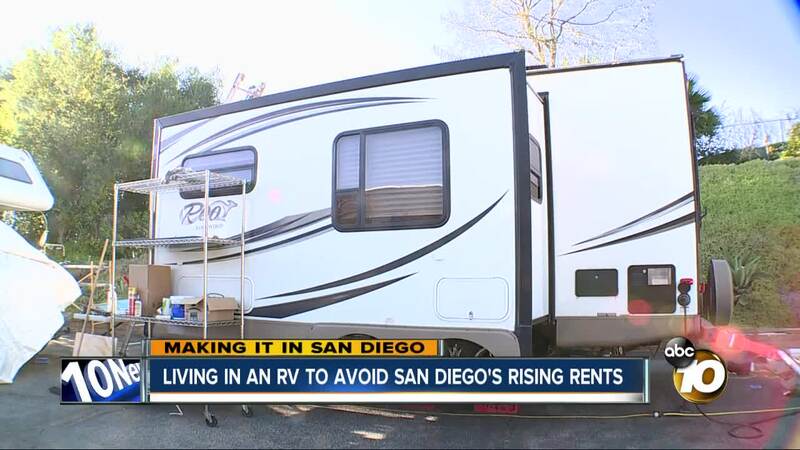 FALLBROOK, Calif. (KGTV) -- Some people are turning to life on wheels to avoid San Diego's rising rents and lack of affordable housing. Johnny Perez moved to San Diego from New Hampshire nearly a year ago. Rather than shell out money on rent, Perez is saving it for travel. "$1,800 bucks for a one bedroom. I wouldn't want to spend that much, cause $1,800 back home, I could rent a whole house," he said. Perez lives in a roughly 300 square foot recreational vehicle. He says it has most of the comforts of home. "I'm the happiest I've ever been, to be able to be mobile, and have that much freedom, not tied down," said Perez. "I don't have a lease agreement or anything like that." Perez says there are some unexpected challenges though. In San Diego, there is no overnight parking on city streets for recreational vehicles. Owners can get a permit, but it's only good for up three consecutive days and it's only valid on the same block as the resident's address. Perez says RV parks charge roughly $1,100 a month depending on where they're located. "I have to find private property or a place that isn't controlled," said Perez who recently passed out fliers around North County hoping to find someone willing to let him park on their property in exchange for a monthly fee. "There's a lot of people who are receptive to the idea of it, but in terms of trying to help me find a place or find a place to park, almost no one," said Perez. That's one of the reasons he's considering downsizing to a van. "I like the amenities of living in an RV, but it sticks out, it sticks out," he said. "So, you're better off in a van, and not having the amenities, if you want to do, and go, and stay where you want." It doesn't take much for the 30-year-old automotive technician to be content. "Home is where you park it," he said. "Home is where you park it."